1 Fairfield is located on the west side of Fairfield, between Beacon and Marlborough, with 351 Beacon to the north, across Alley 416, and 3 Fairfield to the south. 1 Fairfield was built ca. 1870, one of three contiguous houses (1-3-5 Fairfield) built for investment banker Henry Chapman Wainwright for speculative sale. As originally built, both 1 Fairfield and 5 Fairfield had pitched roofs with dormers, and the three houses formed a symmetrical composition on Fairfield. 1-3-5 Fairfield were built on two lots with a combined depth (frontage on Marlborough) of 66 feet: a 30 foot lot Henry Wainwright purchased on October 7, 1870, from the estate of Sidney Homer, and a 36 foot lot at the northwest corner of Marlborough and Fairfield he purchased on November 19, 1870, from a real estate investment trust formed by John Templeman Coolidge, Franklin Evans, and Charles Henry Parker. Both lots were part of one of several parcels originally purchased by the trust on January 29, 1866, from the Boston Water Power Company. The trust subsequently subdivided the property into lots, which it sold to investors and builders, who then frequently resold the lots to others. 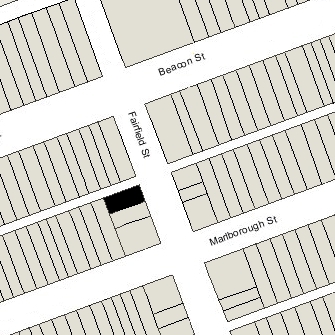 When he sold the completed houses, Henry Wainwright included in the deeds a four foot wide easement at the western boundaries of 1 Fairfield and 3 Fairfield to provide access to the alley from 1-3 Fairfield and to permit drainage to the alley from 1-3-5 Fairfield. Click here for an index to the deeds for 1 Fairfield. On September 18, 1871, 1 Fairfield was purchased from Henry Wainwright by Matilda C. Carruth, the wife of attorney William Ward Carruth. They lived in Newton. On October 27, 1871, 1 Fairfield was purchased from Matilda Carruth by Holmes Hinkley, a Latin teacher, who lived there with his mother, Eliza (Alger) Sears Hinkley, the widow of Thomas Warren Sears, a merchant and auctioneer specializing in produce, and of James Frederick Hinkley, a draughtsman. They previously had lived at 40 Fourth Street. Living with them was Eliza Hinkley’s daughter by her first marriage, Olivia (Sears) West, the wife of Preston Carpenter First West, and their children, Elise Alger West and Montgomery Sears West. Preston West was the chief mining engineer for the Calumet and Hecla Mine in Michigan, where he lived for much of the year. Holmes Hinkley continued to live at 1 Fairfield until his marriage in January of 1887 to Susan Heywood Stearns; after their marriage, they lived in Cambridge. She also was a teacher. Her sister, Charlotte Champe Stearns, married Henry Ware Eliot and was the mother of Thomas Stearns (T. S.) Eliot, the poet. Elise West continued to live at 1 Fairfield until her marriage in December of 1890 to Oliver Ames, a real estate and railroad investor. Prior to their marriage, he had lived at 306 Dartmouth with his parents, Frederick Lothrop Ames and Rebecca Caroline (Blair) Ames. After their marriage, they lived in North Easton, where his family’s business, the Ames shovel company, was located. They made North Easton their primary residence until 1898, when they purchased 15 Commonwealth as their Boston home. Holmes Hinkley died in February of 1891. 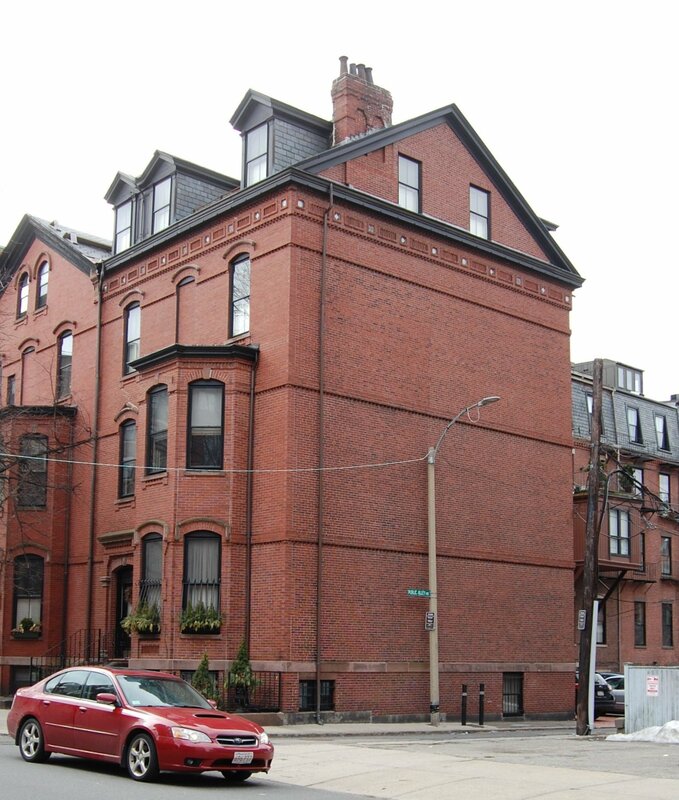 1 Fairfield was inherited by his widow, Susan, who continued to live in Cambridge. Eliza Hinkley, Olivia (Sears) West, and Montgomery Sears West continued to live at 1 Fairfield until Eliza Hinkley’s death in January of 1892. On January 12, 1892, 1 Fairfield was purchased from Susan Hinkley by Marguerite C. (Falck) Taylor, the wife of Charles Henry Taylor, Jr.. 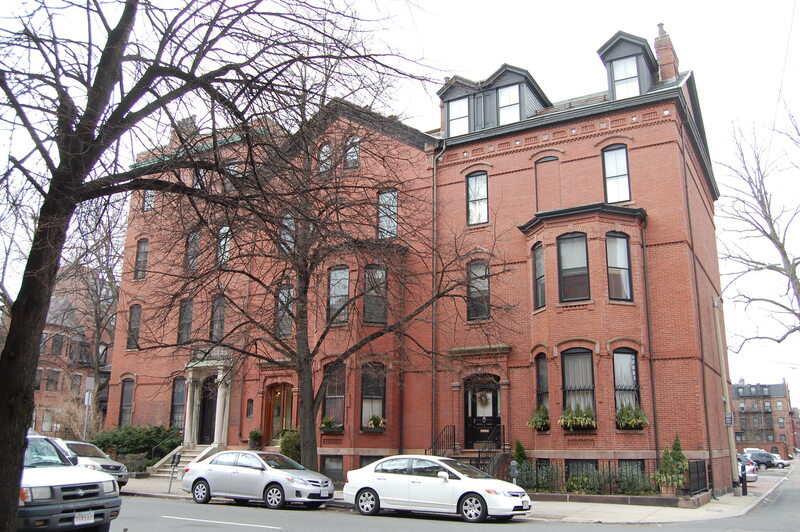 They previously had lived at 158 Newbury. Charles Taylor’s father was publisher of the Boston Globe. Charles, Jr., joined the Globe staff and, after working in various positions, became manager and treasurer. He remained in that position until his retirement in 1937. 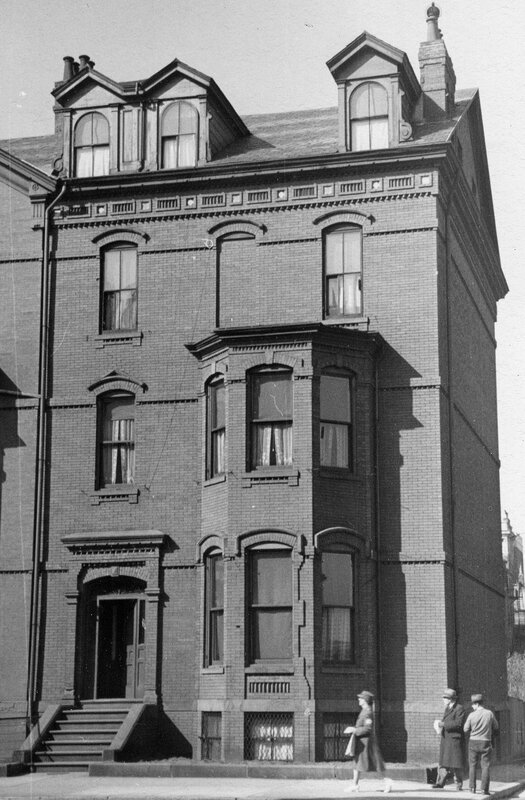 The Taylors continued to live at 1 Fairfield during the 1899-1900 winter season, but moved thereafter to Bourne. On August 14, 1900, 1 Fairfield was purchased from Marguerite Taylor by Frances E. (Pomeroy) Daniels, the wife of Alanson Long Daniels, a note broker. They previously had lived in Brookline. They also maintained a home in Beverly Farms (ca. 1905) and later in Wenham (by 1925). During the 1907-1908 winter season, Alanson and Frances Daniels lived at 10 Commonwealth with Frances Daniels’s aunt, Esther (Pomeroy) Ahl, the widow of Daniel Ahl. They may have been living at 10 Commonwealth while remodeling was being done at 1 Fairfield. They probably continued to live at 10 Commonwealth during at least part of the 1908-1909 winter season (they were listed in the 1909 Blue Book at both 10 Commonwealth and 1 Fairfield), but had moved back to 1 Fairfield by the 1909-1910 season. Alanson Daniels died in December of 1931. Frances Daniels continued to live at 1 Fairfield until about 1945. She died in Wenham in 1946. On May 24, 1945, 1 Fairfield was purchased from Frances Daniels by John T. Ward and his wife, Agnes (Dowd) Ward. They previously had lived at 160 Mt. Vernon. A former professor of electrical engineering at MIT, he was a vice president of Boston Edison. They continued to live there until about 1950. On January 18, 1950, 1 Fairfield was purchased from the Danielses by John Whitman Watson, an insurance broker. He and his wife, Marie (Phillips) Curley Watson, made it their home. 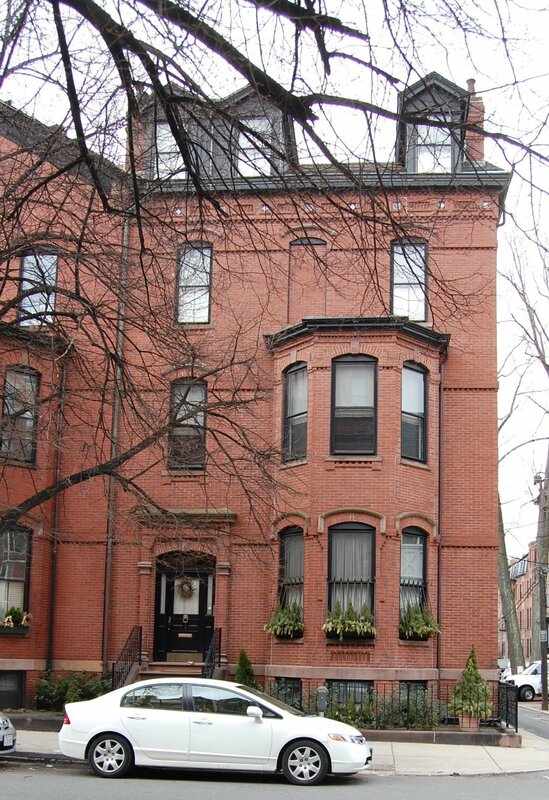 They had married in January of 1949 and previously had lived in an apartment at 31 Massachusetts Avenue. Marie Watson previously had been married to Paul Curley, the son of Governor and Mayor James M. Curley. They had divorced in 1942. Prior to their marriage, she had been a dancer performing under the stage name of Lillian Duval. John and Marie Watson separated in June of 1950 and divorced in December of that year. He continued to live at 1 Fairfield and in Miami until his death in March of 1954. On June 25, 1954, 1 Fairfield was acquired from John Watson’s estate by Pietro Belluschi and his wife, Helen (Hemmila) Belluschi. They previously had lived at 18 Trull, and before that in Cambridge and in Portland, Oregon. Helen Belluschi died in March of 1962. He married again in 1965 to Marjorie L. Bruckner. They lived at 1 Fairfield and, on April 8, 1971, he transferred the property into both of their names. They continued to live there until the early 1970s, when they moved to Portland, Oregon. In October of 1978, Laura Rasmussen filed for (and subsequently received) permission to convert the property from a single-family dwelling to a two-family dwelling. The Rasmussens separated at about this time and on August 21, 1980, Norman Rasmussen transferred his interest in 1 Fairfield to Laura Rasmussen. On November 14, 1986, 1 Fairfield was acquired from Laura Rasmussen by Richard P. Campbell and his wife, Barbara Campbell. The property subsequently changed hands. The legal occupancy remained as a two-family dwelling in 2010. From 1986, however, it was assessed as a three-family dwelling. It remained assessed as such in 2017.